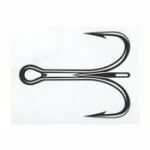 Arguably the strongest treble hook available - 4X strong! Extremely sharp right out of the box. A perfect choice for custom plugs or as replacement for straightened out trebles. Offered only as closed eye for strength. Goes perfect with any heavy duty split ring.